The postman has just brought my copy of the Welsh Bulletin. 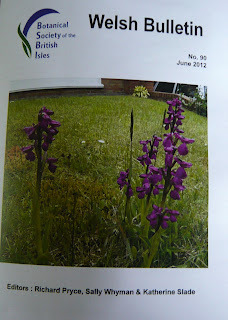 This magazine is published twice yearly and received free by members of the BSBI living in Wales. Other people can subscribe at a cost of £2.00 per issue. To subscribe, contact me via http://www.bsbi.org.uk/merioneth.html first, please. This issue, No 90, contains interesting Welsh records of new or updated finds from 2011, listed by county; I am pleased to say that over a quarter of our Merioneth records were made by our local recording group, Merioneth Nats, which shows what a great contribution you are making. Thank you all again for your support. 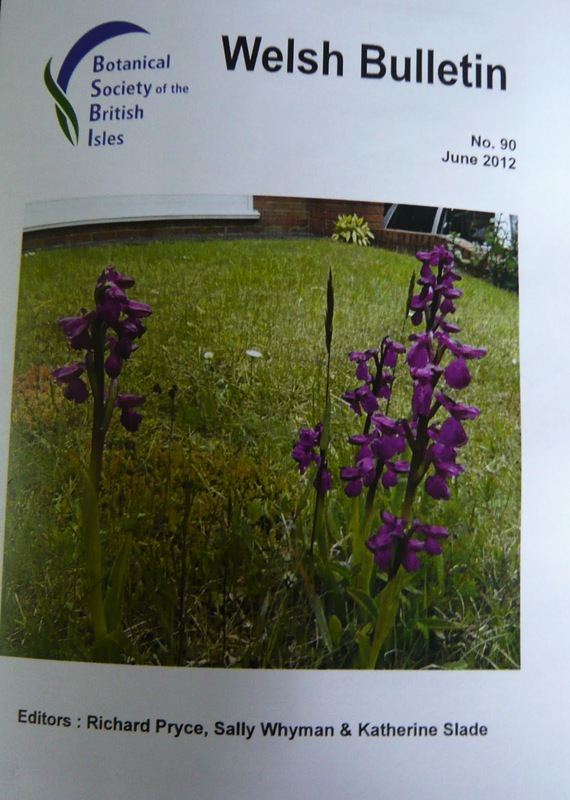 The front cover has a magnificent photograph by Richard Pryce of Anacamptis [Orchis] morio, Green-winged Orchid, which is another plant in this year's Threatened Plants Project [TPP]. Sadly one of the Merioneth populations is known to have disappeared and the other recorded sites have not yet been visited. So if you have seen it this year, please let me know! Dafydd was founder and President of Cymdeithas Edward Llwyd, which is dedicated to Welsh naturalists. "Mae'n gweithredu'n gyfangwbl trwy gyfrwng y Gymraeg. Mae Cymru hefyd yn ei ddyled, a hynny oherwydd iddo sefydlu Cymdeithas Edward Llwyd a chychwyn y cylchgrawn, y Naturiaethwr." Among other interesting articles in the Bulletin are ones by Tim Rich [Poa bulbosa, Bulbous Meadow-grass] and Andy Jones [Carmel Woods NNR], and a report on last year's AGM in Pembrokeshire. Happy memories - what a lovely event that was! An excellent new blog Sarah; safle ardderchog.